Lynxspring's Onyxx platform (an embedded edge family of modular, open, hardware, bridges and gateways that support Cloud applications), partnered with SkyFoundry's SkySpark® Everwhere™, provides the capability to run SkySpark analytics locally at the edge and send data to SkySpark in the Cloud. 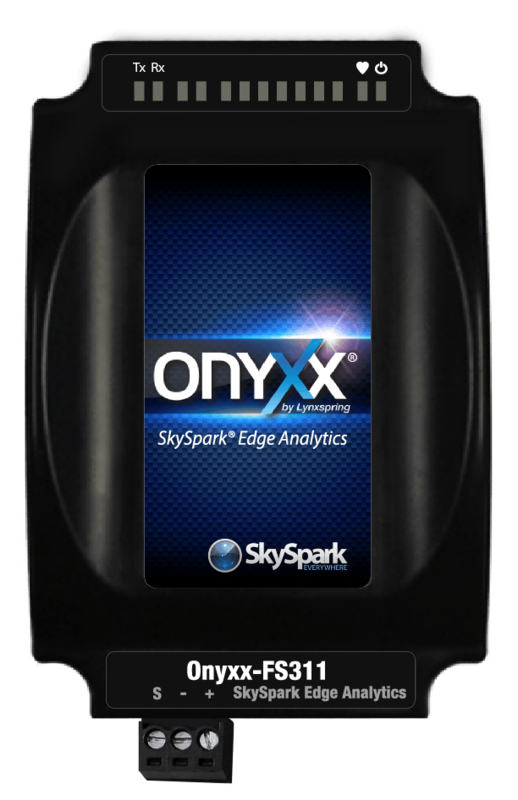 The Onyxx® SkySpark® Edge Analytics is a stand-alone, SkySpark® Everywhere™ embedded device. SkySpark Analytics allows users to analyze important data at the edge and gather real-time intelligence. This device enables data from BACnet and Modbus to connect locally with SkyFoundry's SkySpark, adding value at the device level. This controller provides Client BACnet and Ethernet data to SkySpark Analytics on-board the Lynxspring Onyxx device. Once the Onyxx FS311 is connected to the network, data is used to populate SkySpark, Spark Algorithms.